The Azimuth team has supported this Nunavut-based project over the last decade from the early exploration stage to the successful completion of the permitting process. 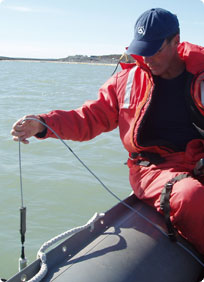 With primary responsibility for issues related to the aquatic environment, our contributions have included conducting baseline monitoring, assessing environmental impacts, developing monitoring/management plans, participating in the Nunavut Impact Review Board application process, developing the No-Net-Loss Plan to compensate for habitat losses under the federal Fisheries Act, and participating in the Nunavut Water Board application process. These tasks have involved working closely with a number of territorial and federal agencies to satisfy a range of regulatory concerns. Construction started in 2007 with the all-weather road and continued in 2008 with site preparation and mine-related infrastructure. Working with AEM and regulatory agencies, Azimuth developed and implemented construction monitoring plans for the in-water activities (e.g., stream crossings and dikes). In addition, Azimuth designed and implemented a fish salvage program in 2008 to remove fish from areas slated for dewatering. We continue to support AEM on a range of issues related to the aquatic environment.